So I crossed the Catawba again, picked up my Nana, buzzed through Rowan County, crossed the Yadkin and didn't stop til we hit the Old Salem Tavern in the 18th Century Village of Old Salem, Winston-Salem, NC. I wasn't perfectly at ease until I got my Bratwurst Platter fully ordered. Then I leaned back in my 1784 chair and cut Nana loose. "Ohhh," she began, "We never made it up here. 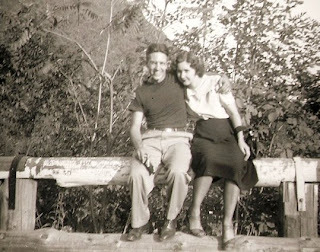 We started out one morning around 1979 with Becky and Harold, but we had to turn back because your grandfather got sick." 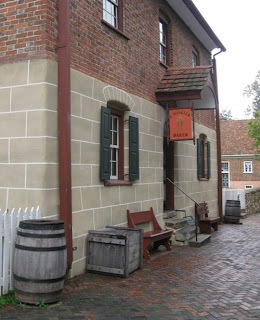 I had never been to Old Salem either. 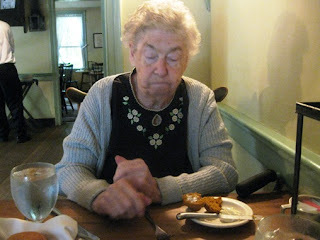 Gram had unusually high energy that day and we had a great time. Old Salem is not handicap friendly. 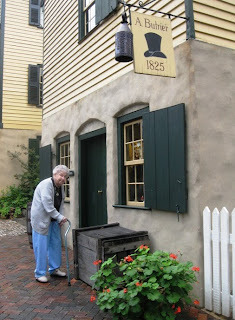 In an effort to re-create 18th century life as it was, the buildings have not been altered for wheelchair accessability. The people at the Visitor's Center were extremely friendly and helpful in advising me as to which exhibits Gram could possibly get into and which had too many stairs for her to climb. We got into the Hat Shop above and barely made it into the Bakery, here to the right. Those were three, rough, high, wet steps for Gram to climb, but she did it. Employees and other visitors were very helpful to us. 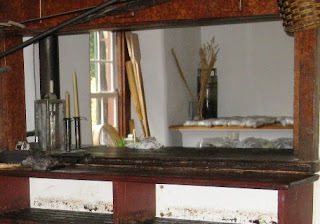 Most exhibits in the historic area require an All-in-One Salem ticket which you can get at the visitor center. Children 5 and under are free. None of the buildings we went in required a ticket, they were all free. These final photos are from the Winkler Bakery. 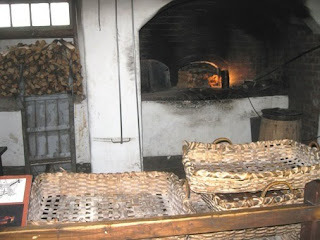 Bread, cookies and other baked goods are still made in this wood-fired oven. We watched a fellow bake and he gave us a bite from a hot loaf of Moravian Sweet Bread. To die for. He then handed me a whole loaf which I purchased upon exit. Lookey to the right, way back on the counter - those are the sweet breads.... cooling. The town is set up within a few cobblestone blocks, worth strolling through on a leisurely day. It was raining and misty for us and we couldn't use the wheelchair on the cobblestone, so we drove through slowly, parked and got out several times. 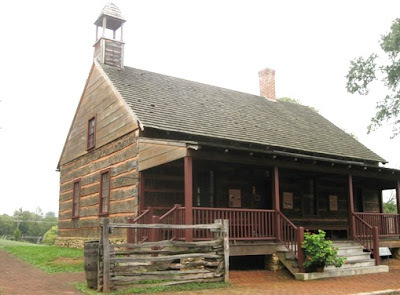 If you're within an hour's drive, take a little trip to Old Salem. It's a wonderful way to spend the day. I can't wait to go back and take Eva. Thanks so much for taking her that day Val, you'll never know 'till you get to heaven what that meant to her, sadly people don't have "time" for the elderly anymore. She has talked and talked about that day-----another jewel for your crown!